Do you offer a product or service that can help independent wellness practitioners and other solopreneurs achieve success in their business? Would you like access to them? 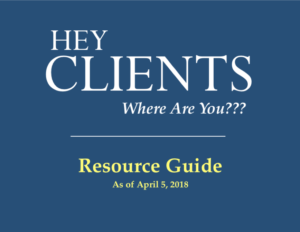 Sign up to be listed as a resource to members of the “Hey Clients, Where Are You?? ?” users group! We are in the pre-launch phase for our book… and we’re already getting requests from independent wellness practitioners on what more they need, and recommendations as to who they should work with! So we decided to find a way to vet and recommend those who can help our readers. We have a one-time fee of $199 that covers a lifetime listing in the Resource Guide as long as your company structure and ownership remains the same, and for as long as this group remains active. To protect our clients and our reputation, all applicants to be listed in the Resource Guide will be fully vetted. 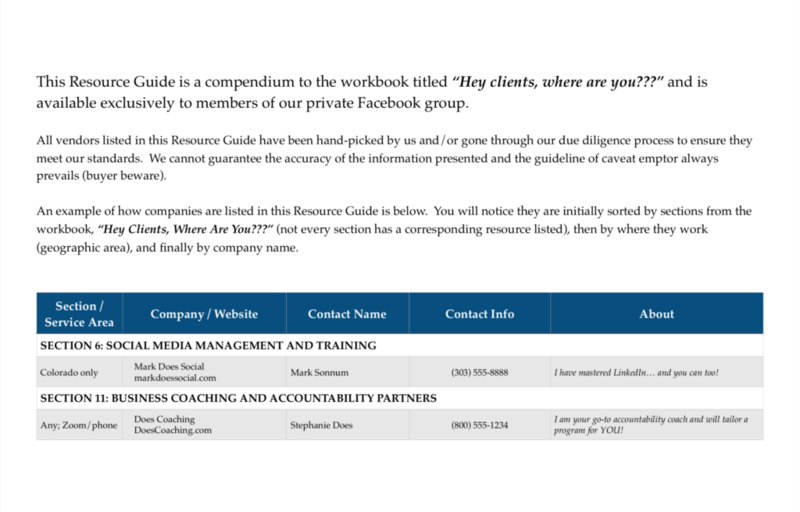 You’ll be listed in our Resource Guide; this is ‘housed’ on our private Facebook page for users of the workbook by the same name. Future plans include housing it on a website. If you want access to the Facebook page – so you can communicate with our members – you will need to enroll in the “Hey Clients, Where Are You?? ?” workshop or webinar series but can do so at a substantial discount. Disclaimer: Applying for inclusion in the Resource Guide DOES NOT add you to the You Define Wellness! network of alternative & holistic professionals, and never will. For more information on how you can be listed in both locations, let’s talk. In the unfortunate event that we are unable to approve your application, all fees paid less $25 for processing will be returned to you. Which contact method do you prefer be listed in our Resource Guide? Check the sections of the Resource Guide where you would like to be listed. About section: You have room for 1-2 lines in the Resource Guide to grab a prospect's attention. What would you like to say about working with you? Have any owners of your business ever been involved in any lawsuit or litigation regarding fraud, malpractice, breach of contract or any similar action, or is any such action pending? If yes, explain in comments below. Please note that this is a one-time fee. You are responsible for keeping your listing current. Listings with bad links or out-dated information may be deleted from the Resource Directory. For CRIMINAL BACKGROUND CHECK, enter names and dates of birth of owners or managing partners. If corporation, provide legal name of business and state of domicile.